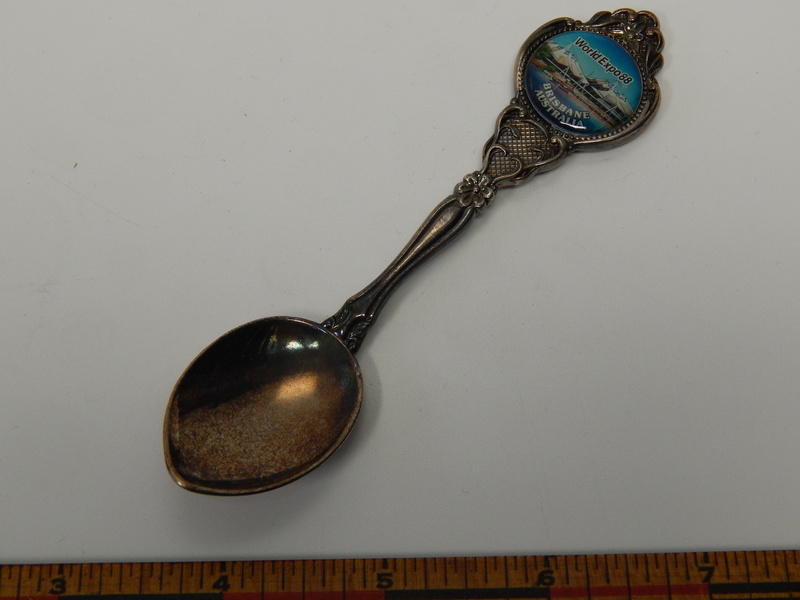 How did this little spoon find its way from Brisbane to Seattle? Another mystery that we will never know. Ah if this little spoon could talk. Expo ’88 was a BIE sanctioned International Specialized Exposition formally named World Expo ’88. It was held in Brisbane, the state capital of Queensland, Australia, during a six-month period between April and October 1988. 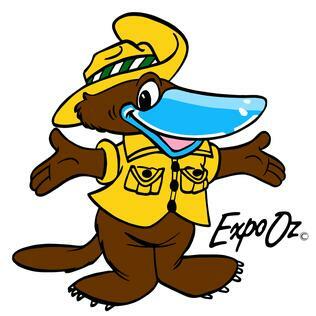 (fairly common date range for a Worlds Fair Spring thru summer and close in early fall) The theme of the Expo was “Leisure in the Age of Technology”, and the mascot for the Expo was an Australian platypus named Expo Oz. I couldn’t resist showing how cute their mascot was. 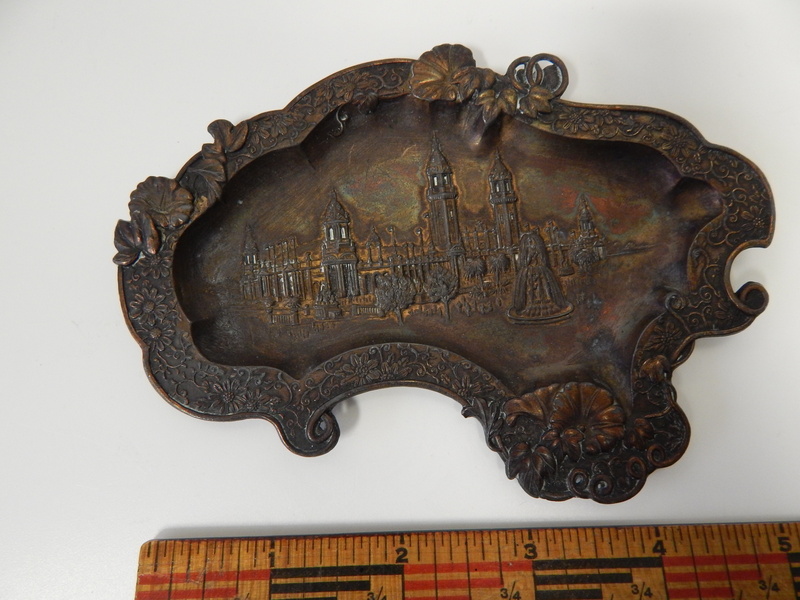 Miles away and over 100 years later I found this little copper metal tray in Seattle. They call these tray’s today but I believe it is really an ash tray. The formal name of this International Exposition was the Louisiana Purchase Exposition. It celebrated the centennial of the 1803 purchase. It is known by most people as the St. Louis Worlds Fair which was one of the largest in number of exhibits and size to date. There were over 1,500 buildings, connected by some 75 miles (120 km) of roads and walkways. The building is very rich in plastic detail and sculptural decoration. The north vestibule is one of the most beautiful entrances to be seen in the Exposition palaces. In the western end of the Palace of Machinery may be seen the power plant of the Exposition, developing an aggregate energy of forty-five thousand rated horse-power. The largest of the engines is the Allis-Chalmers vertical and horizontal refrigerating engine of five thousand horse-power, but the most powerful is the Curtis Steam Turbine, installed by the General Electric Company, developing eight thousand horse-power and capable of producing twelve thousand horse-power under adequate steam supply. Very interesting also, are the four three thousand horse-power Westinghouse generators. 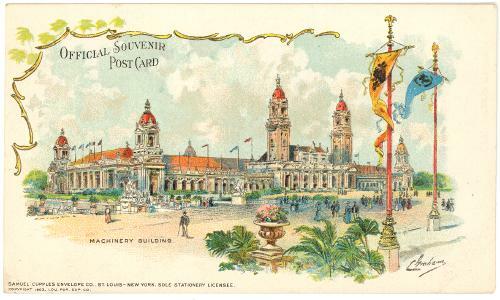 To give you a little better idea of what a grand building and fair it was here is a postcard of the era. Lastly, here are some more pictures of the gem I found so far away from its host expo. I have to point out my vintage ruler. I like to use it instead of a common plastic one from today. They don’t make things like they used to. 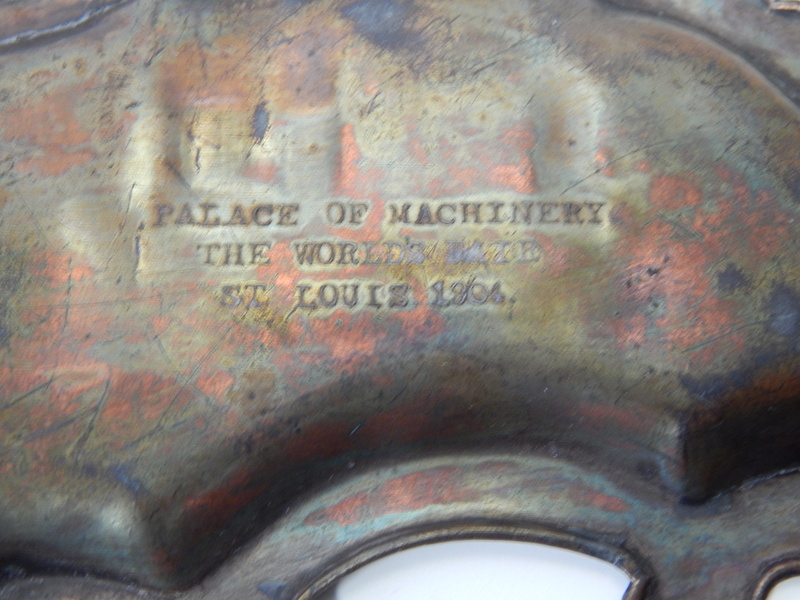 Back of tray identifying it as 1904 St Louis. 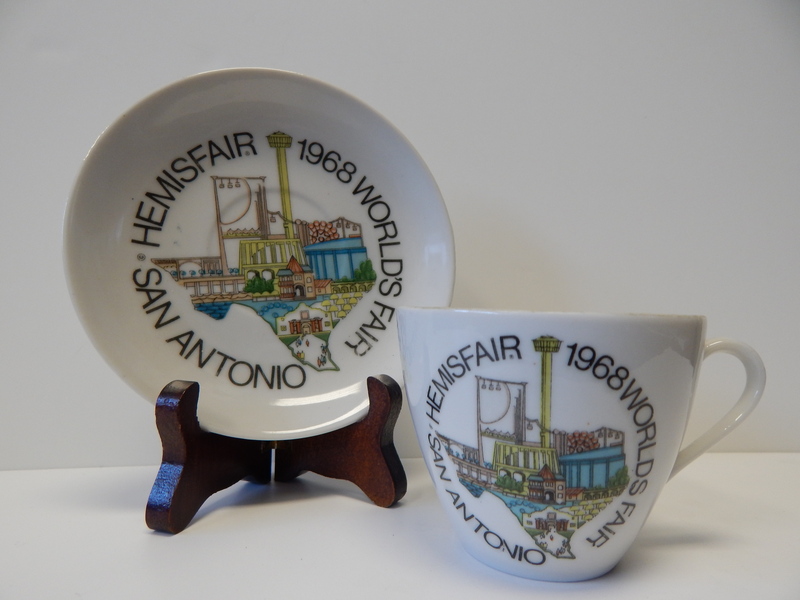 It was a surprise to me when I stumbled upon this small collection of memorabilia from San Antonio’s HemisFair ’68 Worlds Fair in Seattle. I have to confess I didn’t even know that this was a full-fledged International Expo approved by the BIE. The set had the usual items, a large plate, a teacup, and a silver spoon. The little surprise is the small demitasse cup. I have to point out that this fair built a tower revolving restaurant that is slightly taller than the Seattle Space Needle. It is called the Tower of the Americas. In 2004 Landry’s Restaurant won the contract to manage this City of San Antonio property. Remember copying something is one of the greatest forms of flattery. I might have grown up in Seattle but have a little Texas in me too with my Great Great Grandfather being an original citizen of Texas when it was a country. However, Century 21 is still my favorite Worlds Fair. The fair’s theme was “The Confluence of Civilizations in the Americas”, celebrating the many nations which settled the region. The fair was held in 1968 to coincide with the 250th anniversary of the founding of San Antonio in 1718. (thanx Wiki for this info). Here are a few more photos for your viewing pleasure and remember that you never know what you will find if you just get involved in life. A popular item found at Worlds Fairs is a teacup and saucer set. I have collected two from the 1962 Worlds Fair. One has a modern theme of the Century 21 logo and the other is more colorful and almost circus in theme. 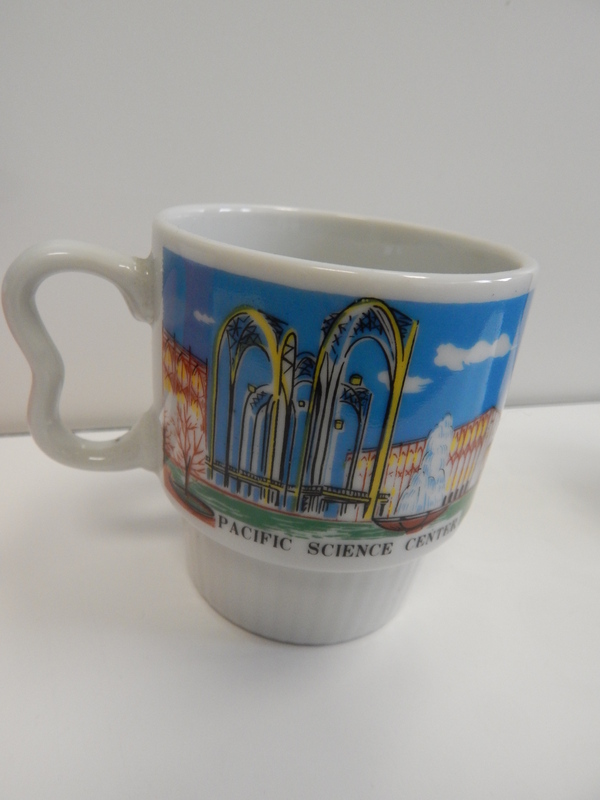 The Century 21 Logo set has a great graphic on the cup with the Space Needle, Monorail, and Science Center. 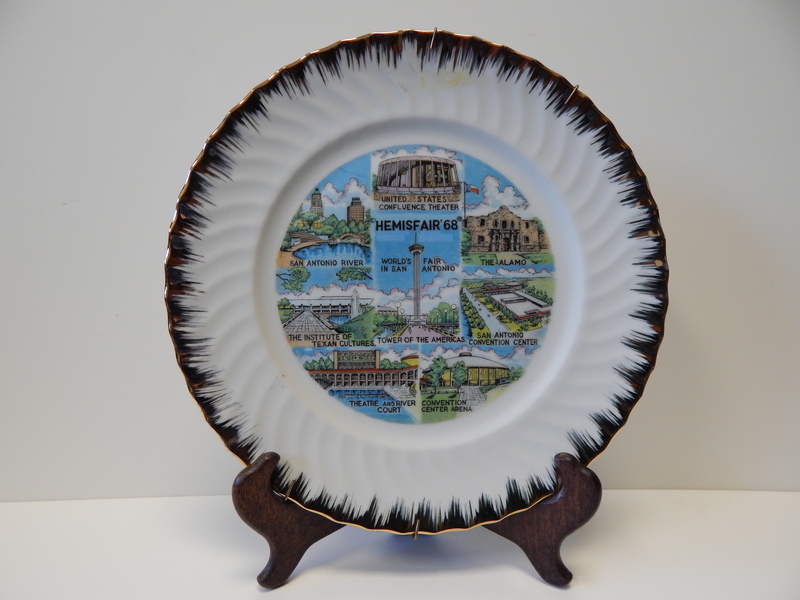 The saucer has Washington State attractions and landmarks. Mt Rainier, Mt St Helens and Grand Coulee Dam to mention a few. I have a large dinner plate that matches. The more colorful teacup set has the US Science Pavilion on the cup. The saucer has the fair’s main attractions. The Space Needle, Monorail, Washington State Coliseum, and the US Science Pavilion. The best part of all is the amusement ride section of the fair is captioned here. It is called the “Glittering Gayway”. Today that would not a politically correct name for a family fun area. The overall look of this set is rather circus like. Many people start their Worlds Fair Collections with glasses. They are a great memory of a time gone by for those that attended the fair. If you went as a kid to a fair, these became day-to-day item for you. Then when you see one years later the memories will just flood back. Lets look at my collection a little closer. This set of 4 that I own have pictures of the different features of the 1962 Seattle Worlds Fair. About 7 inches tall and are made of white frosted glass. 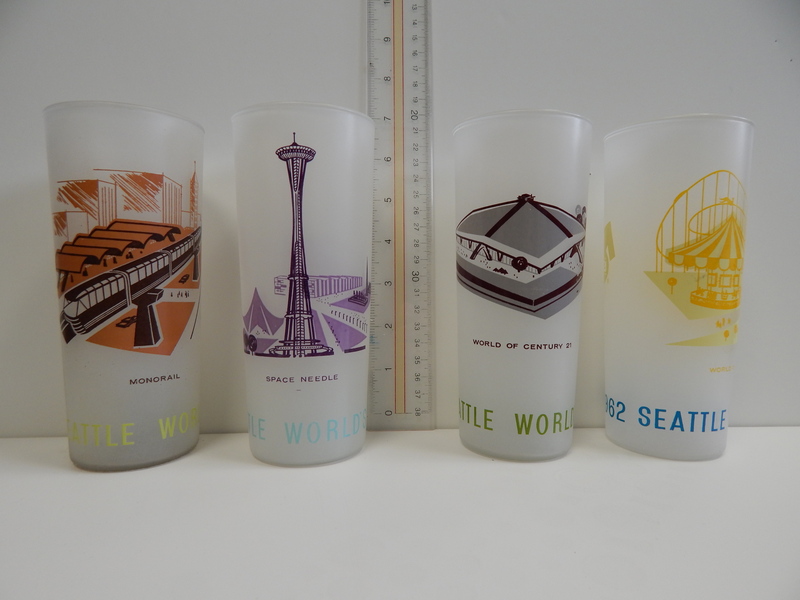 Each one has 1962 Seattle Worlds Fair around the bottom. And the Century 21 Logo on the back. I have the Space Needle, the Monorail, the Washington State Pavilion (aka Coliseum or Key Arena) and the World of Entertainment (aka Gay Way). The Next set of glasses are more outdoor cooler style. 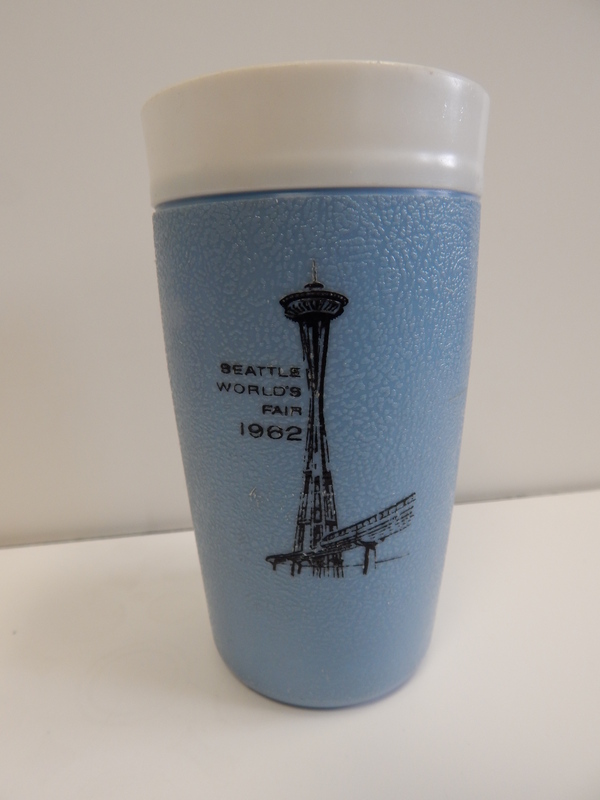 I partnered a mug that really isn’t from the fair but it has three of the Seattle Worlds Fair Exhibits on it. The set of four coffee mugs with the Century 21 Logo on them were meant to go camping and are indestructible. Their cold/hot thermos type construction is usable even today. 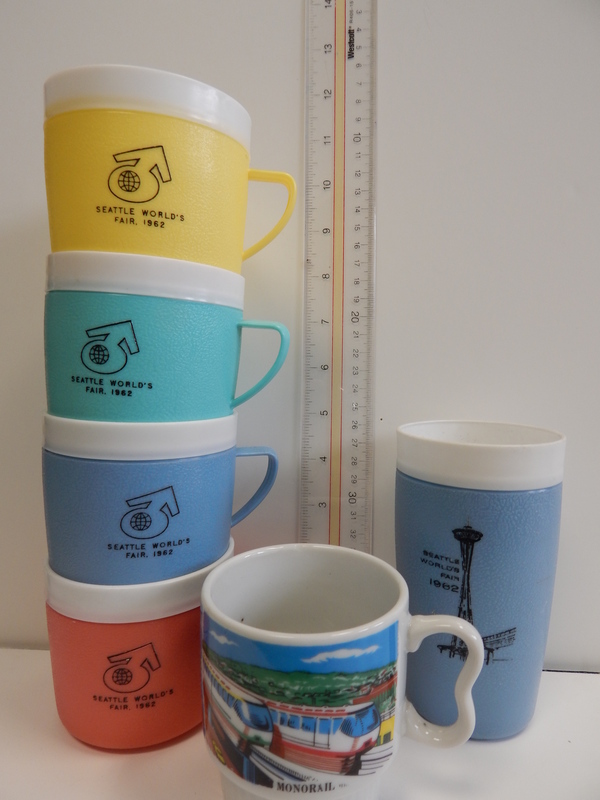 There is a set of four mugs with different colors and I have two of the tumblers with the Space Needle on them. Then we have the little impostor. 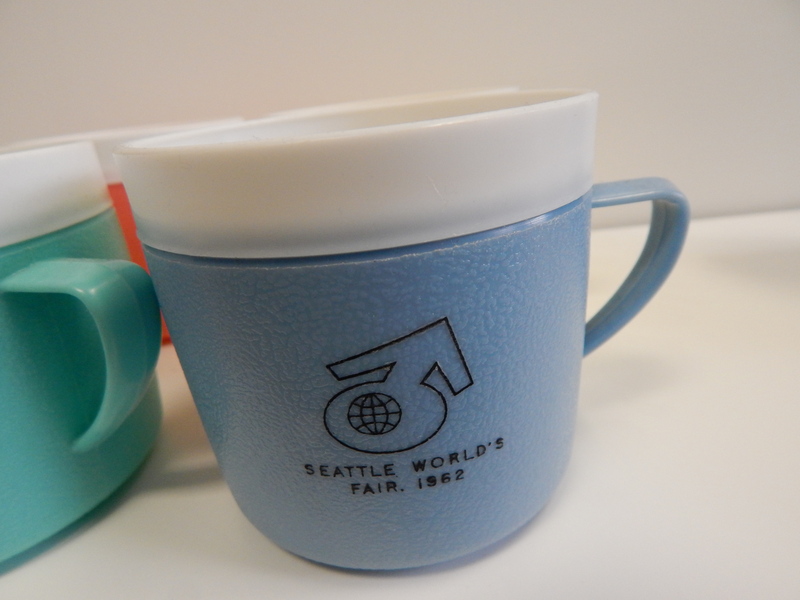 This coffee mug looks like a Seattle Worlds Fair piece of memorabilia. But look close at one of the pictures. It has the Pacific Science Center. That is the post fair name of the Science Exhibit. At the very end of the fair the US Science Exhibit was given to the city. It was renamed the Pacific Science Center. So, good try little cup. Last we have a set made with clear glass and have golden rims. This set like the frosted set each feature an exhibit or building at the fair. They have Seattle Worlds Fair 1962 around the base and on the back in white lettering it tells you about the exhibit it features. 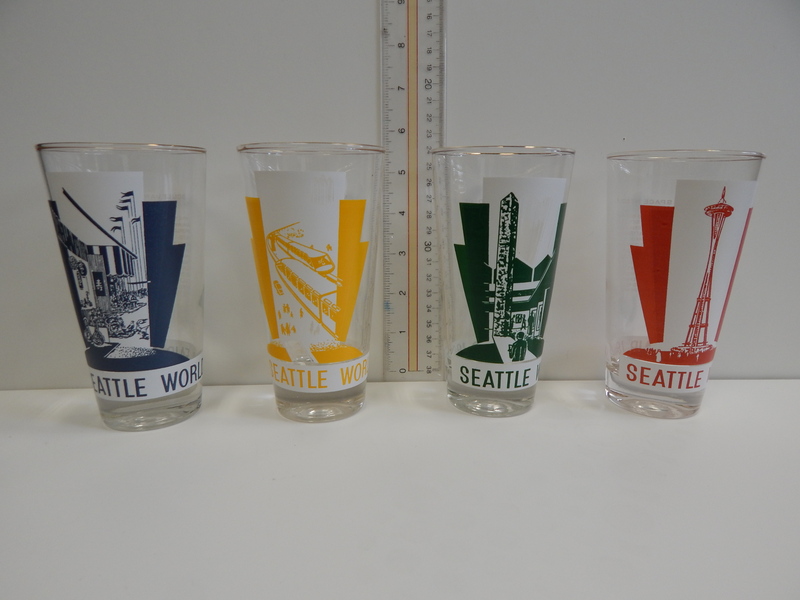 All glass sets have to include the Space Needle. Another feature that even lasts today is the Alweg monorail. Lastly we have the World of Art.